The Supreme Court of Pakistan has allowed Bahria Town Karachi to resume work and to complete its projects. The decision came in along with barring NAB from taking any action against Bahria Town and any officials directly or indirectly linked with the project. 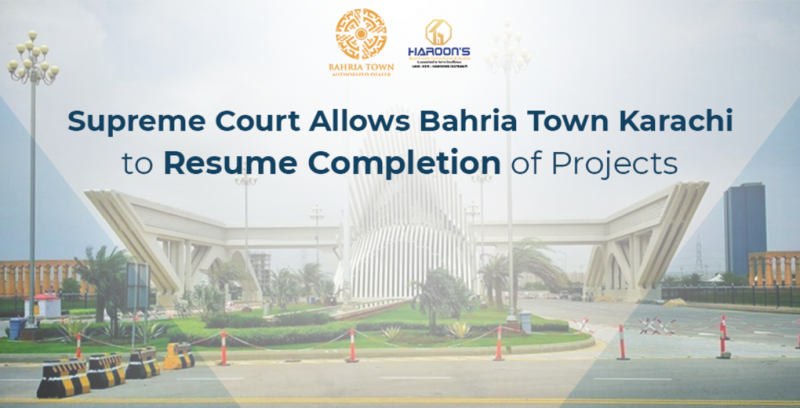 As per the court order, Bahria Town can now collect payments and dues from investors and allot-tees so that the construction work can be completed within the committed deadline of project completion. Malik Riaz, the honorable chairman of Bahria Town, appeared before apex court and clarified his stance on the issue. He said that it is hard work that Bahria Town has gained trust of investors and residents from the country. He added that there are investors from many parts of the world willing to invest in Bahria Town projects in Karachi, Lahore, and Islamabad, which projects a great image of Pakistan. He said that he and his team was committed to providing the residents with state-of-the-art facilities for their residential and commercial projects. He also mentioned that no real estate company has ever delivered such modern and luxurious facilities in short spans of time like Bahria Town has done. After the decision came out, investors from Pakistan and overseas thanked the court for saving their investments and hopes going to the drain. Now that the decision has come out, the construction work in Bahria Town Karachi has resumed with a pace faster than ever. Chairman Malik Riaz has ordered the management to complete the project construction before the committed deadline so that the investors do not turn their interests towards other real estate projects. It can be said that the future of Bahria Town Karachi is now safer and brighter as the verdict has come out in the interest of project. All the conspiracies against Pakistan’s best residential project have clearly failed as the project is on the verge of breaking records. The investors who invested a great amount of their savings in this project are content after hearing this verdict from the court. One of the most promising projects that is now becoming a rise of Bahria town is Gwadar Golf City definitely will become a mark of success for Bahria town Karachi. If anything, this positive development will prove to be a good sign in the growth of real estate sector of Karachi and Pakistan. Bahria Town Karachi is the biggest project ever planned by Bahria Town. Spread over an area of 44,000 acres land, the project has a total cost of more than $1 billion. Bahria Town Karachi is going to have Grand Jamia Mosque, which will be world’s third largest mosque. As this residential and commercial project offers many luxurious and modern amenities such as Advanced Security, Gold-Class cinemas, State-of-the-art sports facilities, International standard hospital, International theme park, 100 % backup power, 5-star international hotel & USGA standard golf course, Pakistan’s largest shopping mall, and much more, there is a great number of investors willing to invest their money in the projects located within Bahria Town Karachi. Why Bahria Town Karachi is a great investment opportunity? Many people wonder what makes Bahria Town Karachi the best investment opportunity in present days. Most of us know that Haroon’s Estate Builder’s & Developers are collaborating with Bahria town Karachi and are doing some amazing projects which will become a rise in the residential development in the country. Bahria Town Karachi is surely the best opportunity for all investors who are seeking good returns. Apart from all the modern luxuries and latest amenities such as Commercial areas, State-of-the-art sports facilities, International standard hospital, International theme park, Wonders of the world monuments (Eiffel Tower, Taj-Mahal, and Statue of Liberty), landscaped parks, and Grid station & telephone-exchange, Bahria Town Karachi will have Pakistan’s largest cricket stadium built on international standards. Every investor and everyone looking for a luxurious residential community looks for all such amenities to make sure their lifestyle is upgraded. Bahria Town Karachi is a safe and secure place with 24/7 CCTV security and guarded by secure walls to keep the residents protected from all internal and external dangers. Getting a new safe house where you can live with your family peacefully is everyone’s dream and Bahria Town is committed to turn this dream into a reality with its projects spread all over the country. To ensure there is no shortage of electricity within the community, Bahria Town Karachi’s management has signed a contract with K-Electric to develop a coal-based and one LNG-powered electricity generation power plant. There is everything you need at the community. Health facilities are equally important and that’s why Bahria Town Karachi is going to have an international standard hospital of 300-bed capacity being built by Saudi German Hospital Group. The total cost of this hospital is estimated to be around $300 million. The world-class infrastructure and premier facilities which are offered in Bahria Town Karachi cannot be found anywhere else in the city. The sub projects in Bahria Town Karachi which are under limelight are Bahria Paradise Karachi which is designed on the theme of New York’s Central Park. The other one is Bahria sports city villas which will be the safe haven for people who prefer a healthy lifestyle. Every year, there are multiple celebrations held at the night of independence. For the last several years, Bahria Town has been stealing the show in Karachi. Thousands of people gather around newly built Bahria Icon Tower located at Clifton to witness marvelous show of fireworks that continues for several minutes. At Bahria Town Karachi, hundreds of families come and enjoy the sight of dancing fountains along with rhythmic music. Functioning as a relief to all five senses, this show of dancing fountain is the best scene to see on the independence night. Now is the time to secure your future as Bahria Town Karachi is on its way to become Pakistan’s best residential community.